Aiming at China's fast-growing luxury car market, General Motors (GM) and Ford (F) are both at the Shanghai Motor Show this week promoting new luxury models: the Cadillac CT6 and the Lincoln Continental. GM CEO Mary Barra was on hand to roll out the new Cadillac and to introduce a plug-in hybrid version of the CT6. "The Cadillac plug-in hybrid promises to one-up its luxury brand competitors in China," Kelley Blue Book executive editorial director and analyst Jack Nerad told MoneyWatch by e-mail from Shanghai. Ford is trying to play catch-up to GM and others in the Chinese luxury market. The company hopes that the new Lincoln Continental, with its evocation of a fabled luxury model from the 1950s and '60s, will score with Chinese buyers. The new Lincoln, technically still a concept car, had its debut earlier this month at the New York Auto Show. 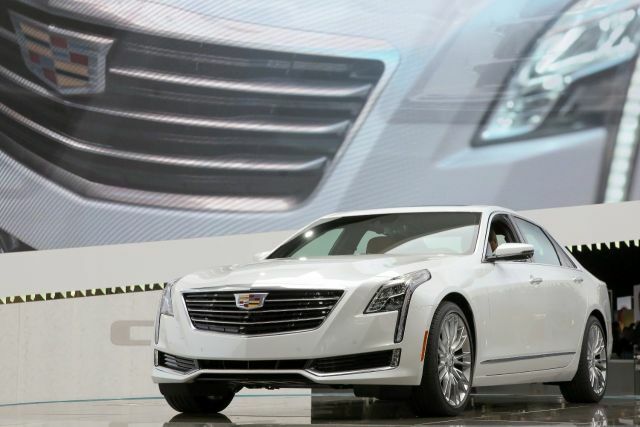 Cadillac CT6 plug-in hybrid: The 2016 CT6 will be the biggest model in the Cadillac lineup, meant to compete with category leaders from BMW, Mercedes-Benz and Lexus. Bringing out the plug-in hybrid version aims to take advantage of changing Chinese government policy. "A key hot button in the Chinese market is electrification," said Nerad. "The incentives to buyers are expected to boost the category significantly." GM says the plug-in electric CT6 will generate 335 horsepower combined from its gas and electric motors. Lincoln Continental: Despite its concept designation, Ford officials are saying the new Continental will appear in China by the end of next year. That could be before the car goes on sale in the U.S. The concept Continental features all blue leather seats, carpets and headliner. The beyond-roomy backseat has a desk with a built-in tablet and entertainment and seat controls. This could attract the sizable segment of Chinese owners who travel in the backseat because they have drivers. Buick Verano: GM also brought a redesigned Verano to Shanghai, and it apparently will go on sale first in China -- now the world's largest car market. As a brand, Buick has probably more prestige in China than in the U.S. "The new version is more stylish than the current Verano," said Nerad. The new Verano will be powered by a 1.5-liter turbocharged engine with 166 horsepower. Volvo S60 Inscription: This luxurious model will be the first Chinese-made car sold in the U.S. market. Chinese firm Geely Automotive bought Volvo in 2010, but until now it has continued to make some Volvo models in Sweden and to sell China-made models mostly in the home market. So far, Volvo's longtime reputation and ratings for safety have held up under Chinese ownership. The S60 Inscription, like the Lincoln Continental, will have an extra-roomy backseat.